Taste BC is an experience of BC’s finest wine, beer and spirits accompanied by tasty fare from the best local restaurants. With excellent food and drinks, attractions include live music, door prizes, and a silent auction that rivals any other. Silent auction items include luxury items, local experience packages, destination packages and delicious products made by British Columbia’s own. 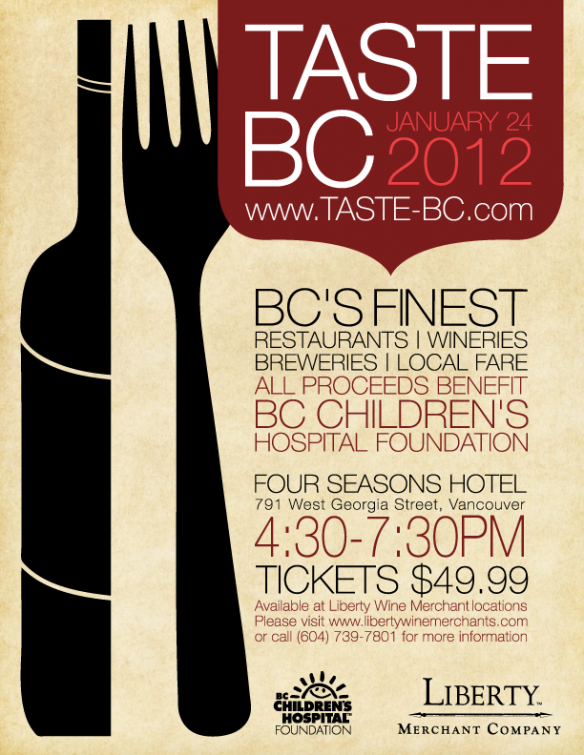 Taste BC 2012 tickets are now on sale! Tickets can be purchased at Liberty Wine Merchants locations for $49.99 each. All proceeds from ticket sales supports the BC Children’s Hospital’s Oak Tree Clinic. For Liberty Wine Merchant Locations: Click Here.